The summer season is nearly upon those of us who live in the northern hemisphere. To keep me cool and comfortable while temperatures rise, I dress in mainly cottons and linens. Although I tend to wear the same colors all year-round, I do have some summer-only clothes, shoes, and handbags. Even when the heat sets in, I still want to look fashionable whenever I leave the house. So, I also shift my jewelry to lighter pieces, in terms of colors, materials, and motifs. When I think of summer colors, I think of white, of course, as well as coral, turquoise, pale jade, spring green, yellow, and other pastels. I also like red as an accent. 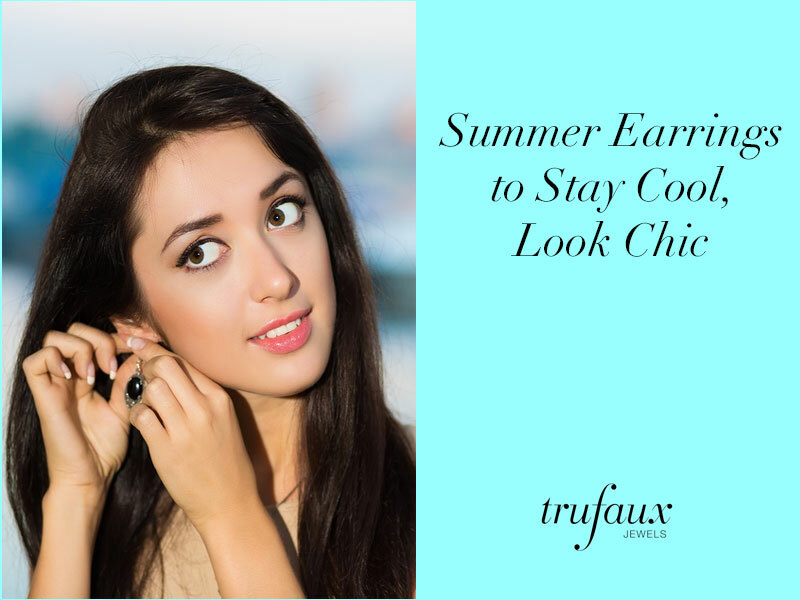 When I put together this month’s styling tips, I focused on summer earrings – pieces that reflect the lightness of the season. I also looked for some that just say “fun”. Let’s see if you agree. On the left is col.or.ful, an outfit adorned with these Lipstick-Red Glass & Diamanté Drop Earrings from the 1920s. This pair, which has ear wires with lever-backs for pierced ears, is light and easy to wear. I don’t know where the term lipstick red came from, but I know it when I see it, and you will, too. The bright red in the earrings complements the bright red cardigan. These hues are from warm palettes (colors with yellow or gold undertones). 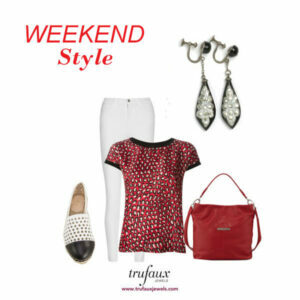 The outfit on the left – WEEKEND Style – shows a cool palette in red, white, and black. (These hues have blue undertones.) The Black Bakelite & Diamanté Dangle Earrings, also from the 1920s, are embellished with a silver-painted design and inlaid stones. These earrings have screw-backs that can be modified for pierced ears. This pair is also exceptionally light-weight and versatile. 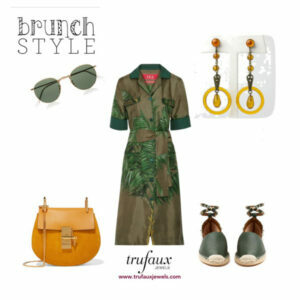 Brunch Style, on the left, features a dress, espadrilles, and bag in warm hues. 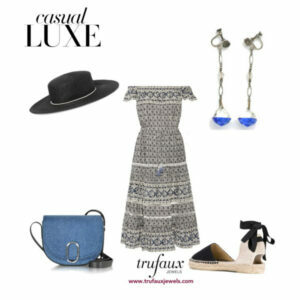 This ensemble may be suitable for a business-casual workplace. The Apple Juice Celluloid Drop Earrings are long with beads that dangle inside the hoops. Length was essential in earrings of the 1920s, when this pair was made, and it doesn’t disappoint at 2 ½”. Made from celluloid, an early plastic that allowed designers to venture into more unusual colors, these screw-back earrings are incredibly light-weight and can be modified for pierced ears. On the right, casual LUXE shows an outfit in one of my favorite combinations of cool hues: black and blue. 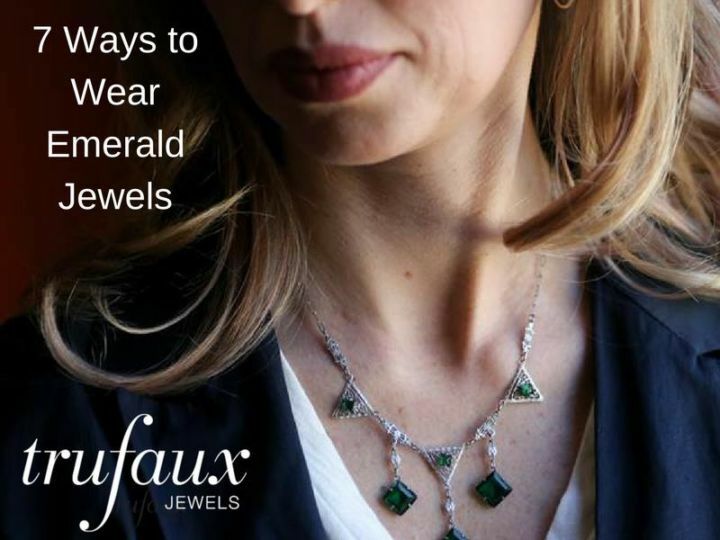 The Sapphire & Crystal Pendant Earrings are delicate and 2 ½” long. 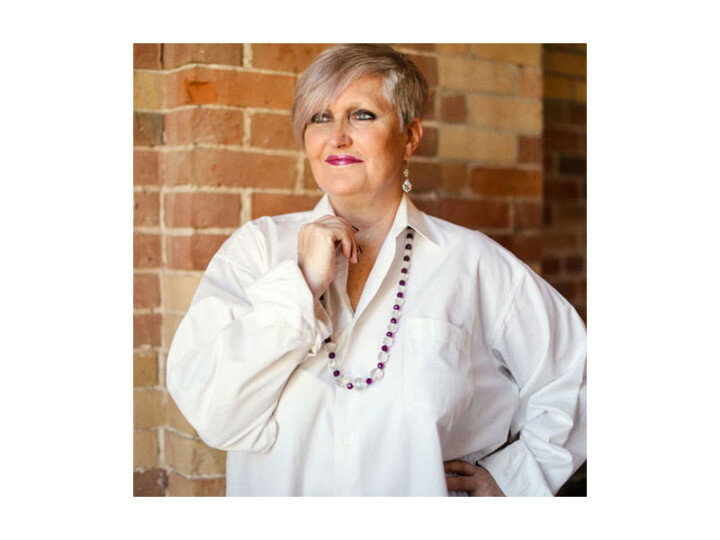 The tear-drop-shaped beads have just the right amount of color to enliven this outfit. These screw-backs can be modified for pierced ears. Here are two examples of earrings that can be worn with a myriad of outfits, from casual to evening wear. I’ve chosen two looks that work for the office and afterward. On the left, a navy dress is the centerpiece in DAY TO NIGHT. I’ve added colors from the warm palettes: these Green Bead Czech Chandelier Earrings, a shawl in a similar hue, and a wonderful, colorful beaded bag. These 2 ½”-long earrings have sterling posts for pierced ears and are exceptionally elegant. On the right is classic BLACK & WHITE, another of my favorite cool-palette color combinations. The beads in the Milk Glass Bead, Diamanté & Gold Earrings harmonize with the shape and pattern of the bag. Both play off of the dress pattern. The beads in these 1940s ear clips by Miriam Haskell are connected to disks of the same material with rhinestone rondelles in gold-tone wire. This construction allows the elements to move, an essential characteristic of Machine Age designs. Ear clips can be worn by women with or without pierced ears.